When it comes to outdoor gear, function usually comes before design. This often means backpacks with all the features you could ever need, perhaps too many, in brightly-colored patterns with enough pockets for a small army. Unsatisfied with the outdoor gear they could buy, a group of Western-bred adventurers started Topo Designs in Colorado, USA. With only their ideas and newly-bought sewing machines, the founders of Topo began crafting prototypes of bags that would be clean and stylish as well as functional. Now, as a notable up-and-coming brand, the company has a collection of five bags that are available in a variety of colors, serve several different purposes, and all ring in at an affordable price for the quality. Topo’s collection includes a large hiking backpack, a daypack, a newly-released sling bag, and two versions of an everyday tote bag. We got a chance to test out the Topo Designs Daypack ($98) and even took it on a camping trip to see just how well it would fare. We’ll give you a little more info on the pack’s specs before we get to our own thoughts. The daypack was designed with everyday use in mind. Take it to work with you, throw your college textbooks in it for the daily walk to class, or throw it on your back for a short day hike. The 1000d Cordura exterior is meant to take on wear and tear with gusto, and the backpack is fully-line with waterproof packcloth. Leather lash tabs on the outside of the pack make attaching extra gear (or a bike light) easy, and extra-large zippers give the wearer easy access to the outside pocket and main compartment. The backpack straps are reinforced with seatbelt webbing for long-lasting durability. While we didn’t make use of the leather lash tabs on our camping trip, just about every other feature came in handy. 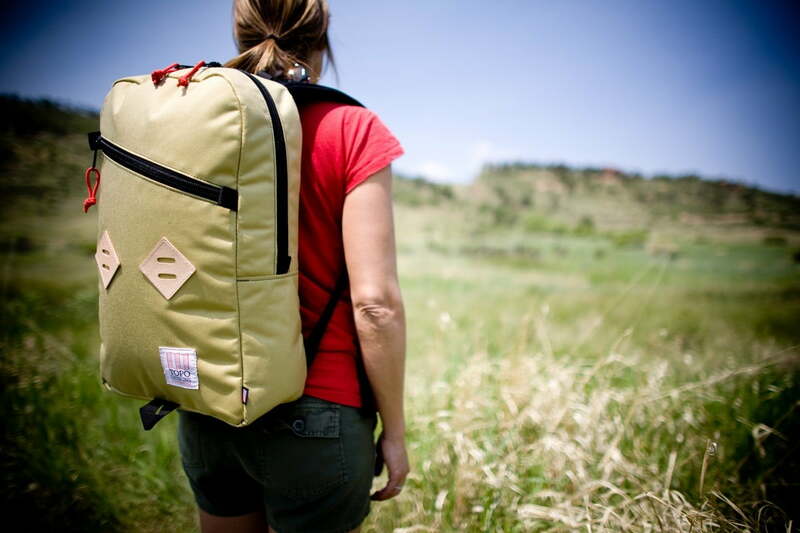 We were impressed with the overall quality of the bag, which was handmade in the LEED Certified (read: environmentally-friendly) Topo building in Colorado. All of the materials seemed extremely durable and our bag didn’t have as much as a scratch or dirt mark on it after being carried around in the Oregon forest and on the coastline for three days. The backpack has more vertical height than most simple daypacks, which means that it can hold more than you’d think. We easily fit a day’s essentials in the pack with an extra change of clothing, large water bottle, and a pair of hiking shoes. One of our favorite features of the bag is the huge zippers. The extra-large zippers and pulls made it easy to always get in and out of the bag without a hitch or snag. The organizer pockets inside the main compartment held keys, chapstick, and other essentials, but there wasn’t a perfect pocket to hold our giant Droid X smartphone. Luckily for us, we didn’t spill anything in the pack, but even if we had, the packcloth lining would make it extremely easy to wipe clean. During our hands-on time with the Topo Daypack, we were very impressed with the bag’s quality, features, and ease-of-use. The bag has great modern styling and functionality that will last for years. Our only significant nitpick would be that an additional outside pocket (like a side water bottle pocket) would make grabbing a sip of water (or quickly accessing your cell phone) much easier. If you’re in need of a great quality, do-it-all general backpack, we’d wholeheartedly recommend the Topo Daypack. It will serve beautifully as an everyday pack for work, school, or your average weekend trip or outdoorsy activity.